Newly revealed e-mails obtained through the Freedom of Information Act show clearly that administrators and lawyers within the IRS headquarters in DC were actively engaged in targeting conservative groups. It wasn’t just some rogue agents in the Cincinnati office; it was orchestrated from the top. And where does the top get its marching orders? Who’s in charge of the IRS? Oh, yes, that would be the president. Yet even this revelation doesn’t shake the Obama administration’s response; full-denial mode is in operation. Does anyone remember President Obama’s reaction to the IRS scandal when it first broke? He was “outraged” and was going “to get to the bottom of this.” Those responsible were going to be found. Does that sound somewhat similar to his Benghazi pronouncements? Yet nothing has been done, at least by the administration, on either count. 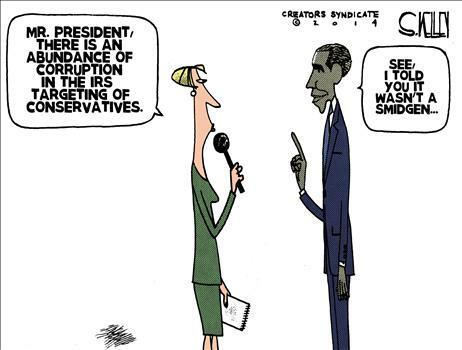 Then Obama did an about-face, declaring that there wasn’t even a “smidgen” of corruption to be found with respect to the IRS. Will any reporter have the nerve to challenge that statement now? If one does, how will Obama respond? Since shame is non-existent with these people, don’t be surprised if he puts on another “outrage” act followed by no discernible action. It’s not easy to be outraged over something you desired to see happen anyway, whether your fingerprints can be traced to it or not. I’m of the opinion the targeting was directed from the White House, but that they were extremely careful to ensure nothing can trace it back to the man at the top. The investigation must proceed. Justice has not yet been achieved.